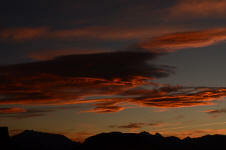 We just returned from hosting a wonderful trip down in Chilean Patagonia. 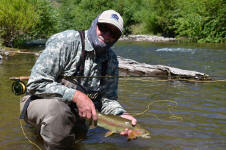 A combination of unusually mild temperatures, ideal water flows, and prolific Cantarias (beetle) hatch provided excellent fishing and very comfortable casting conditions. 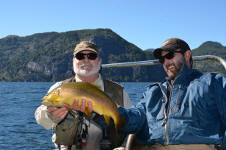 Combining two lodges with access to diverse and productive waters enhanced our angling experience even more. We began our fishing adventure at Cinco Rios near the town of Coyhaique with access to ﬁve major rivers and their tributaries. We enjoyed the luxurious and modern Cinco Rios lodge, surrounded by Andes mountains and rain forests, and three days of ﬁshing spectacular Patagonian rivers and lakes fed by glaciers on a ﬂoat. 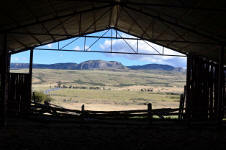 The second half of our adventure took us to wild and breathtaking Estancia del Zorro, situated near the border of Argentina on a rolling ranch country. 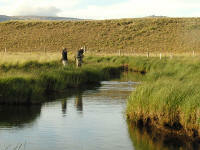 Private spring creek runs through this 15,000 acre Estancia with huge brown trouts up to 33”. In addition to the spring creek, we waded other near and far waters including a private spring creek in Argentina. 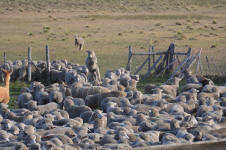 We took advantage of the long Patagonian daylights and fished hard for 3 days. Our hard work paid off nicely when we can hold a nice fish like this one! 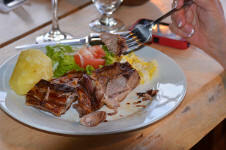 After each day of ﬁshing, we were welcomed by the lodge staff with fresh pisco sour and warm empanadas. Every night, we were treated to sumptuous gourmet Chilean cuisine and wine before retiring to our spacious and comfortable rooms. The last night before our departure, we share our stories and friendship with the guides and staff over the traditional Asado BBQ and Chilean music. 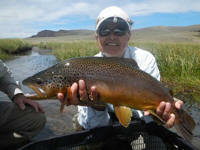 This event is a wonderful way to conclude one of the most memorable fishing and travel experiences of our lifetime. Any angler who enjoys travel and has appreciation for other culture should put Chilean Patagonia as one of their top destinations. 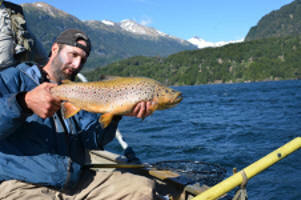 Sierra Pacific Fishing Adventures is planning to return to Chilean Patagonia in January of 2013. Did I say BIG FISH!